We have been very lucky here in Knoxville considering the severe weather across the Southeast this week. We're under a tornado warning right now and have been under a tornado watch from noon today until 11pm tonight. But things have passed by us this week. A lot of folks have not been so lucky. 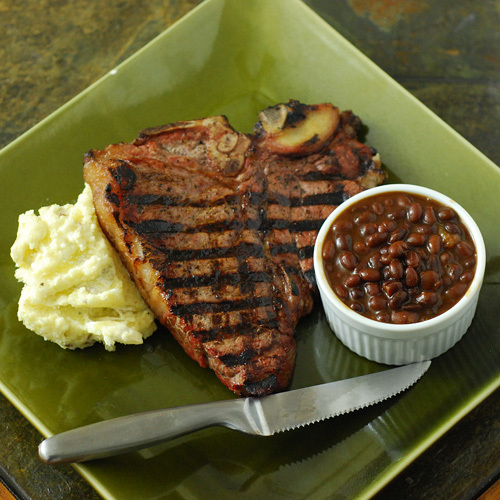 Somewhere between the storms this week, I managed to grill a few T-bones one night. I figured since I was doing a reverse sear and had about an hour of a 250f cook, I would try smoking some Yukon Gold potatoes for use in mashed potatoes. Turned out to be a fail. Well, not a fail, they tasted fine. But I actually prefer our normal mashed potatoes, so the extra effort wasn't worth it that night. 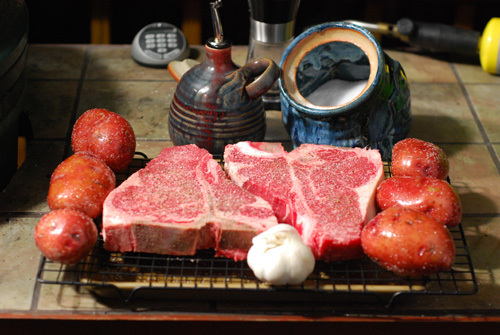 I think just roasting the garlic with the steaks would have gotten sufficient smokiness since potatoes have such a mild flavor anyway. So no recipe tonight. 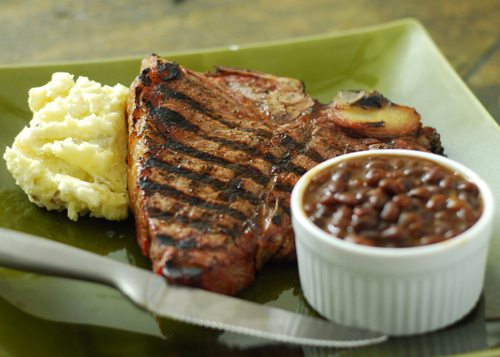 I usually don't grill T-bones, I prefer ribeyes, strip, and fillet. But I got a good price on these at Sam's and couldn't resist. It's like they used some kind of Jedi Steak Mind Trick or something. It all went into the Big Green Egg at 250f like this on one tray. The steak was seasoned with just salt and pepper. I oiled and salted the Yukon Gold potatoes and just oiled the head of garlic. Slow roasted it until the steaks hit an internal temp of 130f. I then prepared my mashed potatoes as normal, including boiling the potatoes since they weren't close to being cooked yet. I switched my Big Green Egg to direct heat. 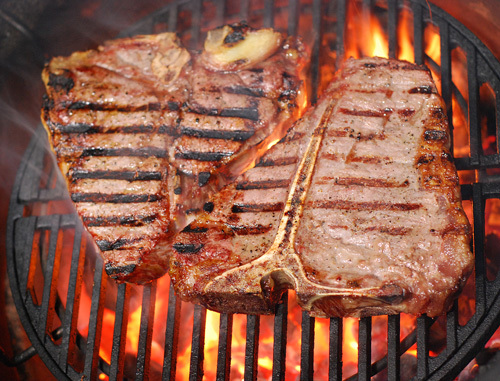 To get a good sear, I used a Spider Rig and a small Craycort cast iron grate to get close to the red hot coals. 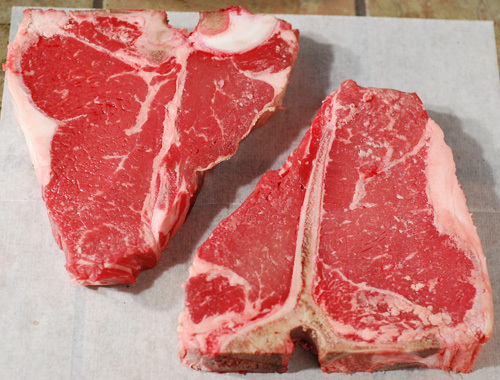 The reason I usually stay away from the T-bone is that the bone keeps you from getting even contact between the meat and grate, causing uneven sear marks. Everything was good and the food disappeared. I just wouldn't follow the same process on the potatoes again, I'd just boil them and add smoke roasted garlic. Sometimes I like smooth mashed potatoes, but normally I like ours thick and rustic. I leave the skin on about every third potato and just coarsely mash them with some sour cream, butter, heavy cream, salt, pepper and garlic. Very basic. If I have Boursin cheese, I like to add some of that and cut the cream/butter. How do you like your mashed potatoes, smooth or coarse? Any special tricks that you like to use for yours?